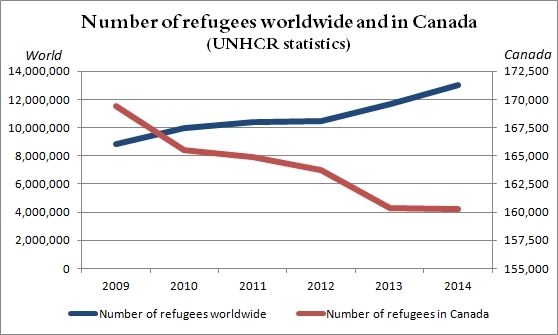 Canada welcomes only a tiny percentage of the world’s refugees with less than 5 refugees per 1,000 population. 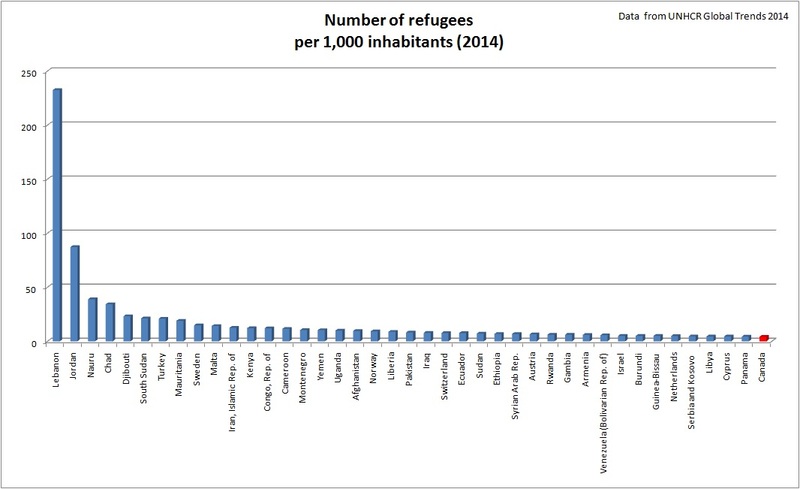 Canada ranked 41st in refugees per capita in 2014. Countries like Lebanon, Jordan, Chad, Kenya and even Sweden host more refugees per capita. Every year thousands of refugees are resettled to Canada from another country where they are staying temporarily. They may be living in a refugee camp, in urban areas or trying to survive in a country where they have no status and few, if any, rights. They may even be in detention or facing a risk of forced return to persecution. For them, resettlement to a third country such as Canada represents the only available solution. Resettlement provides protection and a durable solution (in other words, a permanent home). Government-assisted refugees, who receive support on their arrival from the government. Privately sponsored refugees, who receive support from private groups. Unique in the world, Canada’s Private Sponsorship of Refugees Program has allowed Canadians to offer protection and a new home to more than 225,000 refugees since its beginning in 1979. Private sponsors are groups of Canadians or organizations. Many sponsors represent faith-based communities. Others include ethno-cultural groups and settlement organizations. Quebec has its own, active process for refugee sponsorship. Private sponsors provide financial support and settlement assistance for the refugees they sponsor, usually for one year after arrival. Interested in getting involved in refugee sponsorship? It is far more difficult to enter Canada as a refugee than as a visitor. The refugee determination process involves security checks by CSIS and the RCMP, fingerprinting and interviews. It is not likely that a person intending to commit a violent act would expose themselves to such detailed examinations. Canada’s Immigration and Refugee Protection Act excludes refugee claimants and temporary residence permit applicants if they are found to be inadmissible on the basis of security, serious criminality, organized criminality or human rights violations. Previous refugee resettlement efforts, including the emergency airlift of 5,000 Kosovars in 1999, have not resulted in any major security concerns. "We appreciate that the world has changed. We share concerns about the protection of the security of Canadians in the post-Sept. 11 world – but security cannot be an excuse for inertia. In addition to providing adequate screening personnel in the field, security risks can be mitigated by a focus on women at risk, families with children, and families with Canadian connections." "We've got to stop being frightened of our own shadow. You know, we live in a dangerous world. We handle it pretty well." Are Syrian refugees really a threat to Canadian security? Refugees must be selected for resettlement according to need. To discriminate against refugees on the basis of religion goes against the fundamental international principles of refugee protection without discrimination. Religious minorities in the region face persecution and will certainly be among those referred for resettlement by the UNHCR. There are also many Sunni Muslim refugees who face persecution. It would be very wrong for Canada to refuse vulnerable Muslim refugees who meet all the criteria for resettlement simply because of their religion. Refugees and their families make significant positive contributions to Canadian society, economically and socially, as leaders, artists, community workers and elders. Flight and Freedom: Stories of escape to Canada, Ratna Omidvar and Dana Wagner, 2015. Refugees pay more income tax than millionaire investor immigrants, March 2015. Canada can and must open its doors to refugees. In past refugee crises Canada has responded quickly and decisively. The same level of commitment is needed now. Flexible measures (such as Temporary Resident Permits) should be introduced for Syrians with family in Canada. The government should resettle a minimum of 10,000 Syrians, brought to Canada immediately. Canadians should be encouraged and supported in resettling additional numbers of Syrian refugees. The government must allocate significantly more resources (human, financial and logistical) in order to realize these recommendations. A national meeting should be convened involving all levels of government as well as representatives of civil society to plan Canada’s resettlement response beyond the end of 2015, and to discuss how to mobilize and coordinate contributions from all sections of society. In responding to the urgent needs of Syrian refugees, the needs of other refugees must also be met. They should not be penalized because of the response to Syrians. Thousands of people right across Canada have stepped up to respond to the Syrian refugee crisis. As huge as the Syrian refugee crisis is, Syrians are not the only refugees in need of protection and a permanent home. According to the UNHCR, a third of the more than a million refugees in need of resettlement are in Africa. There are generations of Somalis in Kenya who have never known life beyond a refugee camp. There are hundreds of thousands of Eritreans, Congolese and Sudanese desperately searching for a safe haven. Whether you are planning to sponsor, donate, or volunteer, consider responding to refugees from other regions as well as Syrians. People of all profiles are forced to flee persecution, and we should respond according to need, not on the basis of age, gender, religion, etc. Currently, there are particular concerns that single men are sometimes being excluded from consideration. Yet some single men may be among the most vulnerable: torture and forced recruitment into armed groups are widespread in Syria and those targeted are often young men. Consider how to practise non-discrimination. If your group is keen to sponsor a family, could you sponsor a single person in addition? Have you connected with Syrian Canadians in your community? If you are looking for someone to sponsor, Syrian Canadians may have some suggestions. Or if you are open to other nationalities, connect with others in your community who will be happy to identify people in need of sponsorship. Having such connections will also help inform and prepare you for the arrival of the people you have sponsored. Consider also reaching out to faith communities. For non-Muslims sponsoring Muslim refugees, it is helpful to educate yourselves about the faith and about resources available in your community (although we shouldn’t make assumptions about whether or how people will practise their religion). There are also many interesting examples of different faith communities supporting each other in their sponsorship initiatives. The response to the Syrian refugee crisis gives wonderful new momentum to Canada’s Private Sponsorship of Refugees Program. However, the Program is facing dramatic challenges, and it will be difficult to sustain people’s involvement unless barriers and delays are overcome. Refugee Sponsorship Training Program (RSTP) has many resources www.rstp.ca/en/ (some aspects do not apply to sponsorships to Quebec).